Raghunandan Panshikar was born on 14th March, 1963, in Mumbai, into a family of scholars and musicians. His father, Prabhakar Panshikar was a well-known Marathi stage actor and producer. His talent was recognized early by his family at a young age and his musical pursuits were encouraged. His formal training started at the age of 11 under Vasantrao Kulkarni. Later, in 1979 he came under the discipleship of the legendary Kishori Amonkar, with whom he learnt till 2000 in close proximity. During this period, he had the good fortune to receive guidance from the doyenne of the Jaipur-Atrauli gharana and Kishoritai’s mother, Mogubai Kurdikar. As a result of his erudite training, he has Raghunandanji’s singing bears the authenticity of the Jaipur-Atrauli gharana as can be witnessed from his command over aakaar, taans, gamak, meend and layakaari. His voice is endowed with a unique, soft texture which he acquired as a result of his training with Kishoritai. His gayaki is emotionally rich and intellectually and aesthetically evolved, and has been enhanced with influences from many other master musicians. Apart from raag-sangeet, Raghunandanji also has a great command over other genres like Thumri, Ghazal, Natya–geet, Bhajan, Bhavgeet and film music. Raghunandanji is actively engaged in grooming several performers from all over India and abroad. His list of disciples includes Shubham Khandalkar, Devika Panshikar, Ashwini Purohit, Saurabh Kadgaonkar Vinay Ramdasan, Radhika Joshi-Ray, Achyut Joshi, Anand Dharmadhikari and others. Manik Verma Puraskar, 2005, Pune. Dattopant Deshpande Puraskar, 1992, Pune. Sangeet Kala Ratna Puraskar, 2000, Patna. Best Music Direction for the play ‘Avagha Ranga Ekachi Jala’ written by Dr. Meena Nerurkar and produced by Natyasampada. An Award from the Government of Maharashtra. 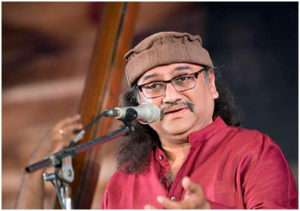 With a very well developed diction, Raghunandanji is at ease with Marathi, Hindi, Urdu and Sanskrit and has sung in numerous classical, devotional and semi-classical albums. He has also composed music for several albums and Marathi plays. He has toured extensively for concerts in India and abroad including the U.S., Europe, and the Middle East. Photo: from the archives of http://www.gaanasaraswati.com/.